On January 19, 2014, the Moderate Resolution Imaging Spectroradiometer (MODIS) on NASA’s Aquasatellite captured this image of a bloom of microscopic organisms off the southeastern coast of Brazil. Note how the waters of the South Atlantic are darkened in patches stretching as much as 800 kilometers (500 miles) from south to northeast across the continental shelf. In the image, the puffy strands of white over the sea and inland are clouds. Biologists working in the area have identified the bloom as Myrionecta rubra (previously known asMesodinium rubrum), a fast-swimming ciliate protist. Though it is not a true phytoplankter, it is an autotroph; that is, it makes its own food. Myrionecta fuels itself by photosynthesis, but it does so byingesting chloroplasts (chlorophyll-bearing plastids) from other algae. Aside from threatening the microscopic algae it consumes, Myrionecta rubra is not known to be toxic to other marine life or humans. Viewed close-up, these blooms have a deep red color. But this bloom appears nearly black in the satellite image because of how the ocean scatters and absorbs sunlight. Myrionecta rubra blooms tend to float a meter or two below the water surface, so whatever photons of red light they are reflecting are likely being absorbed or scattered on their way back to the surface. 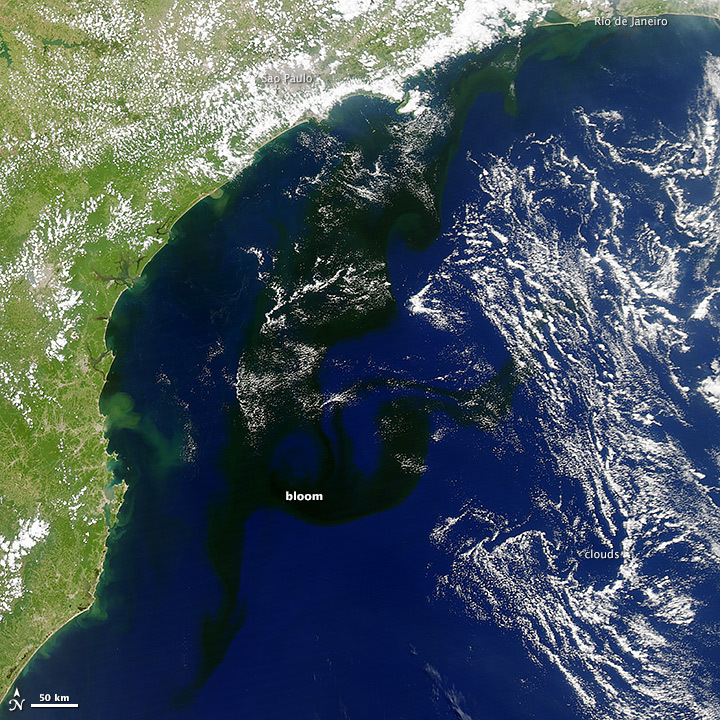 Closer to shore—look near Rio de Janeiro and Sao Paolo—the water has a green tint, perhaps signs of a different bloom of phytoplankton or of sediments stirred up by recent flooding in the region.